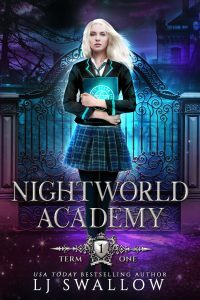 Welcome to the Nightworld Academy, attended by vampires, shifters, and witches. A place filled with harmony and mutual respect between the supernatural races. Sometimes. I’m told my curse is a gift. A valuable one that could cost me my life. My visions of the future are weird, but my new school is weirder. All lessons take place in the evening and the majority of students are on an advanced program where they take extra classes late into the night. I enrolled at the academy because my last school expelled me for punching another student. Nobody believed that I knocked Tyler unconscious to stop somebody else dying. But why would they believe the crazy girl? I expected to meet other troubled teens here, but the pupils are predictable for an English boarding school. There’s Ash, the rugby team captain and the academy’s most popular guy. Then there’s Andrei, the moody guy with a bad attitude who takes pleasure in annoying me. And Jamie who’s studious and friendly but intense. I thought I had the academy figured out: the mean girl, the quirky friend, the nerd, the emo, and the jock. But on the evening I swear allegiance to my new school house, everything spins out of control and I realise I’m dealing with more. One of us will die, and I know who. Portal To Fantasy Presents…. The April Book Fair! All books are FREE, 99c, or FREE to read with Kindle Unlimited. Don’t miss out on these great bargains if you like Epic Fantasy, High Fantasy, Sword & Sorcery, or Contemporary Fantasy. There’s something for everyone! The 99c preorder price will increase to $2.99 once Amazon processes the price change. Keep In Contact with LJ Swallow!